A pilgrim of Saint James and an awarded professional photographer with a dual citizenship USA-France, Jean-Pierre Rousset began the photographic inventory of the landscapes and the monuments along the Way in the 90’s. He was then President of the Friends of Saint James Association of les Landes, a French Department with many pilgrimage itineraries to Santiago de Compostela. As such, he was closely involved in their rebirth. He worked on the field, when ancient paths were hidden in the forest and had to be cleaned by hand. He took part in the long process of convincing cultural and political authorities (Ministry of Culture, Mayors, lands owners), that it was worth saving the Camino from oblivion, like Spain had already done for years. At that time, there were neither itineraries, nor signs to find one’s way, nor lodging. Numerous Romanesque churches were on the verge to fall apart. With a small team of passionate people, he eventually convinced those who had the money and the legal authority to take the challenge of creating the modern Way of Saint James, following the medieval route as closely as possible. Between 1990 and 1998, he travelled more than 10000 miles with his cameras, shooting hundreds of sites and monuments, organizing dozen of exhibits showing the many treasures that should be connected together by the pilgrimage routes. In 1997, he was contacted by French Ministry of Culture to elaborate a selection of monuments. France had decided to have its Way of Saint James recognized and therefore to apply for UNESCO’s World Heritage official list registration. It would be approved by UNESCO in 1998. In 1999, he hosted at his home a meeting with all the presidents of the French Friends of Saint James Associations. They unanimously voted that the european yellow shell on a blue background would be the unique logo used to mark out the pilgrimage routes in France. In 2002, he created an art books collection with Sud Ouest Publishers (Bordeaux), to show the marvels located on the french routes (urban and rural architecture and landscapes). 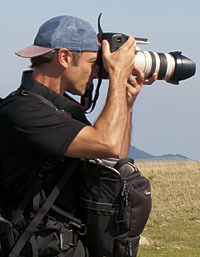 This huge project led him to collect on assignment more than 30,000 images, part of them can be seen on this website. In 2005, he decided, for family reasons, to immigrate to the United States. Living in Maine, he was thrilled to discover how enthusiastic American people were about their own heritage and was immediately contacted to create a slide show in Portland about the Way of Saint James. He now shares his life and work between his two countries.